16th COLLABORATIVE EI – AMIGOS MISSION TRIP! For the 16th consecutive year Amigos Eye Care, and Enfoque Ixcán joined together to complete a successful eye care mission trip to Ixcán, Guatemala. In mid-August, 8 optometry students, 5 optometrists and 3 other volunteers spent 4 very busy days seeing patients. Two days were spent in the region’s main trading town of Playa Grande and on 2 days we traveled to the villages of Las Rosas and Ingenieros, where we worked mainly with the school children. The temperatures were hot and the humidity high, but it didn’t slow the team down as they examined 1,050 people and dispensed 557 pairs of glasses and a couple hundred sunglasses. This year we tried out a portable lens edger (this cuts lenses to fit into frames). The edger was a donation from Amigos Eye Care. The 2 opticians with us taught our eye health promoters (EHPs) how to use the machine and 14 pairs of glasses were made on the spot, saving time and money for the patients. Our EHPs will continue to use the edger as they work with patients throughout the year. This is a big step toward making our project more self-sustaining and offering better service to our patients. Another innovation on this trip was the introduction of low vision care, eye care for those folks who have subnormal vision due to accidents, disease or congenital eye problems. A low-vision specialist, Dr. Christi Closson, was with us this year. Dr. Closson treated 3 patients with significant low vision problems, with gratifying results. 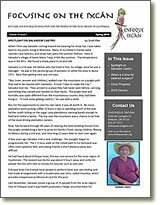 You can read about one special patient on page 1 of this newsletter. In addition to the eye exams and glasses, 43 patients were found who need eye surgeries. The eye health promoters took 30 people to the surgery clinic the last week in September. Twenty cataract surgeries were performed on this trip, funded by your support of Enfoque Ixcán.